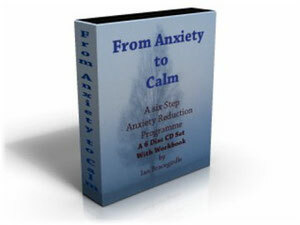 Announcing the new six-step Anxiety to Calm System with CD reinforcement. Are you struggling with an anxiety concern? Do know someone who is? Read on. How does this Almond Sized part of your Brain make you suffer Severe Anxiety? Learn how I used secrets of our minds to help you overcome your problem with this 6-part Guaranteed-system. 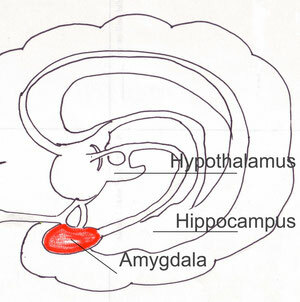 Would you believe it, the little area coloured red on the brain diagram above labelled Amygdala is responsible for your anxieties, panic attacks and your worries, it’s all the result of the tricky nature of that little but very significant organ in our brain. Over 20 years ago if a doctor had told me all the weird things I had experienced for years were the result of that little red devil I would have asked for its removal. I know better now but back then it made sense. Mind you it probably would not have come to that as I never told anyone, not even doctors, about the things I experienced, except for those physical obvious things which seemed potentially life threatening to me. The internal fears and embarrassment I kept to myself. Up to 20% of people in western cultures* suffer from an anxiety disorder. *NIMH in the USA estmates 18% of adult US population has an anxiety concern in their life time. It could well be higher because some people never seek treatment. Many people suffer in silence, as I did, whilst others watch on. I remember watching Lily sitting in the pub next to her husband, as she sat quietly tearing tissues into tiny strips, no one knew why, she was just considered a bit odd. It’s such a personal thing, even now lots of people are afraid to talk about their experiences and fears. Many sufferers’ feel they’re alone; you are not on your own. Millions of people have similar problems and the knowledge is growing so that relief is becoming more and more effective. There is lots of experience of this problem and the old methods are changing rapidly, help is at hand. Your body naturally responds to danger to protect you. Have you ever wonder why and how this works for you? Read on to learn how your body’s natural biological processes cause you to experience anxiety with the help of the Amygdala. Then find out how you can be helped. Let’s admit it the personal discomfort of an anxiety disorder can become unbearable, even just thinking about it can bring back those feelings. To talk about the hurt and tragedy of an anxiety disorder may seem pointless as you know each detail of your problem intimately, however your experience of anxiety is unique. Each sufferer has their own tale to tell because each and everyone of us follows a different path with a personal focus. For the instance some of you may focus on and be perfectly happy socialising with friends and relations but find relating to strangers difficult, Others may find mixing with even well known people a difficult and stressful task. In the teaching profession I know some teachers who are perfectly happy to present an assembly to fellow staff members, pupils and parents in a full assembly hall. Yet when it comes to being judged for an evaluation by a senior member of staff, who may also be a friend, the teacher may freeze, become anxious and go to pieces. A fear of giving presentations may link back to being shown up in front of a class by a teacher. With others it could be a desire for perfection. Lawrence Olivier, the famous actor, had the reputation of being a perfectionist. The anxieties generated from this probably caused him to fear going on stage and the feelings then made him vomit before a performance. With general anxiety disorder (GAD) you may find discomfort in the bowels while others may struggle with overwhelming tension in the neck and shoulders. All the while both may well be coping with the deep dread of impending problems of an unknown nature. Agoraphobia can grow from having only one panic attack and the fear of it happening in public again and being show up in front of others. This one experience may colour the rest of a person's life. Another agoraphobic person may have a highly developed social phobia where potential judgement by others, even in small groups, becomes unbearable. I have met and worked with people who have such a deep fear of the world that they cannot bear to go out of doors alone These frightened souls keep safe by staying at home to lower their high sense of anxiety and create a sense of personal safety in the home. These people may find it impossible to leave the home. Some of these fear-full people are too afraid to make changes in the way they think and live to improve their lives because the thought causes yet more fear. It feels safer to stay the same even when change could make life so much better. This all makes sense when you realise that over the years friends and relations have been developing ways to protect the person from their fears making them feel very protected and loved. Imagine having all your outside chores done for you, shopping, visits to the doctors become home visits, friends and relations come to the house, would you want to change and face a new fear? The Amygdala is the common factor for us all. This little structure is there to protect you from danger and potential threats and it also helps us learn to recognise potential dangers in double quick time. No conscious thought is involved with this very efficient job but it has a tendency to over react. It also has direct links to our experience of good things and the creation of memories so it does have a very positive side too. Our little helper has some neat tricks, to protect us it turns on the fight, flight, response when we are threatened. This begins to create problems. The fight flight response belongs to our primitive midbrain and as such it belongs to one of our more primitive ancestors but it is still useful for us now. Think of it this way. In the past our hunter-gatherer ancestors needed to respond to threats and dangers very quickly as a means of survival. Faced with a wild beast or an aggressive enemy they needed the ability to fight or run and in some cases remain still, however in the current world this is not always the first priority. This all happens very quickly. Almost instantaneously. In this almost instantaneous preparation for action the amygdala sets in motion various biological functions to make your actions more efficient. Adrenaline flows into the bloodstream to help running or fighting. The thinking part of the brain gives way to instinct. Blood can flush the face. Sweating and sticky palms may develop. The body is ready for immediate action. Muscles are pumped up ready to respond. All these actions set up the body’s resources to achieve safety. The body's response by-passes our conscious intelligence causing us to act dumb! This next problem is the icing on the cake because the amygdala is extremely good at learning new threats very quickly. Say, for instance, once in your life a dog bit you, this new piece of information would be recorded as a new kind of danger. From only one experience this memory is now available to the amygdala as a comparison by which to judge similar dangers. Because the amygdala works very quickly to protect us it is not always very good at matching like for like. It may see of big friendly dog as a dog that is going to bite! Have you ever noticed how some young children are afraid of all dogs, big little, friendly, bouncy, barking, snarling, wanting to have fun, it does not seem to matter what approach the dog uses. The child has for some reason learned with the help of the amygdala to treat all dogs as a danger. My grandson, who is now 10, still reacts to every dog he sees as a potential danger, he is not as afraid as he used to be but he is very wary. Let me just repeat; because the amygdala is good at learning threats quickly and it does not have a very good way of checking like for exact like, it generalises and this causes mistakes that then trigger off the rush of adrenalin and all the other effects. The fight flight reaction is turned on before our corrective good sense can react. What you have just read is a basic explanation of how phobias and PTSD can develop so quickly and easily. In our modern world direct threats to our safety are much lower than for our ancient ancestors. You may not feel this is the case but only a few apparent threats result in the need for fight or flight. Many modern threats need no confrontation or the need to run, as the threats tend to be more mental than physical. due to the amygdala’s signals our body is now charged up ready to respond, whilst the need to do so is being held back by good sense. Rapid breathing, which leads to hyperventilation. Lowered ability to think logically. A general sense of discomfort and fear. Plus several other potential creators of fear and anxiety. In the primitive world these feelings would have been total unnoticed as the individual focused on actions and achieving safety. In the modern world we are stuck with all the rapid and natural biological changes but no way to use them safely. Fortunately these feeling do reduce naturally but they can stay present at a lower level ready to rise again as in General Anxiety. Those of you who have ended up at the hospitals emergency department thinking that you are having a serious problem will know all about this. At the basic level all anxiety problems stem from the amygdala’s ability to trigger the Fight Flight response before we have had a chance to think logically. Then to make matters worse the other weakness is the amazing imagination it can persist in doing a great job of deciding that these natural effects could be a heart attack or some other feeling of impending doom. It is obvious that we need a solution that will reduce the amygdala’s error strewn responses a need for a new way of dampening down the habitual response and building new ways of behaviour is essential. There is good news here, because you are already using part of the right technique to reduce your anxiety. You may ask how does this fit in with me? I’d like to teach you a way out of your anxiety, how to understand your responses; stabilise your life and find the happiness you deserve. The story begins when I was about 15. I was always unsure about being in public, at parties and found dating was rather difficult. Being ginger haired I tended to blush very easily and was always aware of it when talking to girls. Mick, my best friend, and I soon discovered Dutch courage would help us through dating rituals. In fact we both later learned that dating is far easier if you let the girls approach you rather than the other way round. We got some success that way. It was only later when I was a young teacher, teaching in a middle school that I realised something was wrong but it took me years to understand what was going on. First of all there was what the doctor called intercostal angina. This part of the story began with a pain in my chest; a stabbing pain near my heart that I imagined meant something was severely wrong with my heart. At this time I was aged about 25 and had been teaching for about two years. I decided that my heart needed looking at, so I went to the doctors. After a brief examination the doctor announced that I had intercostal angina. He gave me painkillers, which I never took. I didn't really understand what he meant by intercostal angina but it did sound bad. Later I discovered that he meant a strain between the ribs. Eventually it seemed to disappear without trace. Another mystery was the appearance of small lesions on my hands; these little breaks in the skin just seemed to open up by them-selves. They caused me little discomfort and were not a big problem. Then magically they spread to my feet. Once more I visited the doctor. Once again I receive little explanation, only that “it” sometimes spreads like this. I wondered what “it” was and why “it” spread. This time the medication was a steroid cream, it had little effect. Socially I was still not good at parties and informal situations either. I was now in a proper relationship with Dot, not long after this we married in Trinidad and I am pleased to say we still are. Despite having a steady teaching job, that I enjoyed, after a few years I desired a change. The trouble was I had a major problem with interviews. I was always told that I came over very poorly as I seemed nervous. Each time I applied for new posts I found the interview unbearable, consequently I failed each one. Don't get me wrong there were lots of positives, a beautiful wife, two brilliant sons, great house and the a car. But still that new job seemed out of reach, each new attempt failed at the interview stage: I just seemed to lack the nerve. At last I did it and landed a new job at another school but now teaching younger children in reception class. I practiced and practiced before the interview to make sure of having a good result. Yes I did it but now I was teaching younger children and was very much out of my depth, plus I was now team leader for two women who were both far more experienced than I and both applied for my job. It was stressful. Two months into the new job and I became ill and needed time to recover, it was just overwhelming stress. I had really bitten off more that I could chew. To cut a long story short I continued this upward spiral each time pushing myself further, practising for interviews to near perfection and finding each new job demanded that I present to or lead larger numbers of people that increased my stress levels further. I felt I had the potential to progress further but still did not feel comfortable in my new role. In front of groups of people I'd almost freeze and put myself over very poorly. Presenting to groups was really a major problem. The problem reached the height with a presentation to over 400 people at a conference for several schools; it was hell for me. Eventually my superior told me I was coming over showing a lack of confidence and appearing totally unconvincing, I had not appreciated how really poor I was in front of an audience. On the other hand I enjoyed all the practical aspects of the job and was good at them; all the other challenges were fine but presenting was a real uphill battle. Mind you if someone had told me I had a social anxiety problem I would have had no idea what they were talking about. Eventually I began to understand the problem. There was a pattern to how it worked through several stages each one leading to the next.  I would prepare very well.  Often working late into the night before a presentation.  I'd ensure everything was ready for my group.  As the presentation began I would feel well prepared and confident that I was ready this time.  About three minutes into the presentation I begin to feel my stomach quaking, then a pain in my chest.  First the shakes would appear in my voice. As the shakes increased I became terrified of having to runaway. I could not, who could present my materials? As time passed my feelings would change and the day would run well. This pattern had been repeated every time I was doing a presentation. These moments of terror coloured the whole process and each time I prayed that it would not happen again. Having discovered this physical and mental turmoil had a pattern I now hoped I could overcome it, I didn't know exactly how but I was determined. I guessed that the whole thing was governed by the release of adrenaline into my bloodstream causing feelings of discomfort; all I needed to do was to ride through it. The next time it happened just as expected three minutes into my presentation I felt tremors. Whilst still talking to my audience I began to accept it as my little friend there to boost my performance and shortly after I was through it no really big shakes, terror or tremor in my voice. Yippee! I had done it.  Getting there and doing it.  Understanding what my body was doing.  Taking my way through it.  My desire to teach what I knew. It worked but I still needed to practice my technique until it became second nature. Soon after the break-through I added the final part of the whole process, by discovering NLP through the work of a guy called Lou Tice. 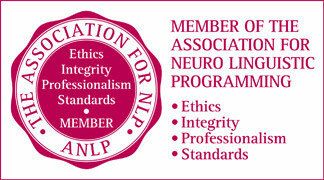 Six months later I had completed an NLP certification course as a practitioner. During the training my blood phobia had been neutralised by an amazing treatment in 15 minutes flat. Then the remnants of my social anxiety and presentation fears were also decreased. 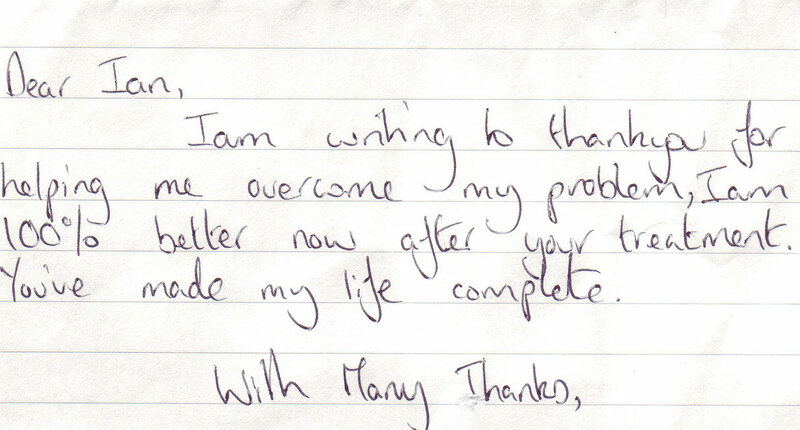 Life felt so much better, I went on to complete an NLP Master Practitioner course then began helping others. Working with other people I soon realised that anxiety was the main cause of my clients concerns. These anxieties ranged from social and general anxiety to the more specific agoraphobia, OCD and various very personal fears, worries and what I call blocks to progress. Whilst I was aware of the different anxiety disorders I began to realise that all anxieties had similar structures and consequently similar solutions. Interestingly this allowed me to recognise my anxieties for what they were, it was as though a veil had lifted crystallising and clarifying my appreciation. My own social anxiety dated way back to my mid-teens and even earlier to blushing in primary school at the age of 5. My feelings of discomfort with the world, my fear of presentations and social situations plus that phobia of my own blood each one was a part of my package of anxieties that I had learned to do over the years. Stress was also a major factor. All the other fears and anxieties are learned from experience with the help of amygdala’s little tricks. Another break-through was realising all those weird incidents I had in supermarkets and other public places were low-level panic attacks. What caused them I’m still unsure but they would begin as I was walking down a supermarket aisle when all of a sudden the world seemed to float away from me, everything was distant and out of reach. It was all very strange, uncomfortable and verging on the terrifying. It was like being suspended in space and time; out-of-touch with the world. I treated it as a strange mental happening associated with my earlier experiences as a Hippy. I had not identified myself as an anxious person, just as having problems dealing with some social situations and presentations. Added to this no one had told me that peopIe could have phobic reactions to their own bleeding. I now understand how not creating my identity around these feelings was very helpful in tackling and eventually overcoming these feelings. To put it another way my strange experiences and feelings were something that happened to me but I did not see them as being part of who I was, not as a sense of it being me. The feelings and experiences were problems to solve. Another common fact connecting all of my internal fears and weird experiences was I did not talk about it to anyone. Isn’t that extraordinary? I internalised everything and kept it secret. Now I know talking and learning will help you. As my knowledge grew I understood how I had dealt with these feelings and could help other people do the same. 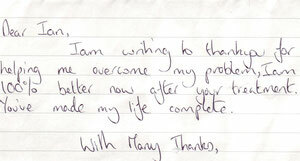 My NLP training then gave me more tools to help others. After helping clients for over 15 years I began to look at making big changes in my approach to encompass all the best aspects of NLP, hypnosis, counselling, teaching with accelerated learning techniques, internet technology and the latest research I had learned from. This led me to more reading and research. This has resulted in new ways to improve the success for my clients by changes in structure of the way I work. This includes communicating new facts to help people understand the nature of what they are dealing with and by adding some new techniques. I now see the method that I use is a teaching one. Imagine what it will be like to live free of overwhelming anxiety and able to react to normal day to day anxieties and worries without becoming stressed out and over anxious. Learning how your mind and body works when stressed and fearful then using new skills to counter your old ways. Understanding the way your anxiety worked and reducing the effects of your old mental or physical triggers. Building new ways of running your emotional life and creating balance using accelerated techniques to help you rapidly adapt these skills………. A. 6 hours of one to one contact in my office or via SKYPE or phone with workbook, CD set and session recordings plus phone access. Introduction to the programme; Commitment to your learning; Accepting where you are in your life journey and appreciating all your accomplishments, building confident first steps. Self-Talk Control. Self Esteem, Self Confidence. Planning changes for the future. Build a new future and tie it all together with powerful visualisation techniques. (a) Talk with you to work out what has gone wrong and help where I can through phone, SKYPE or e-mail, until you feel calmer. (b) Or I will give you your money back no questions asked. A. 6 Six full hours 1 to 1 with me. £60 per session or £300 pounds paid up front, backed up with the above CDs and individual recordings of each session to take home and reinforce your learning. You will also receive a personalised workbook.
] Note For option A there will only be 9 places each 6 weeks. B. 6 CDs as above PLUS one whole hour with me of 1 to 1 support (in person, in the office, via SKYPE or by phone). Cost £97 plus workbook. Option B currently not available due to re-recording. Note For option B there are only 6 places each week because of the one hours one to one support. Option C currently not available due to re-recording. Whichever way you choose, remember your commitment is essential. If you don’t believe that you can commit and concentrate on the programme with my help then save your money. No Telesales people pushing you to buy. To Book or Order right now phone 01535 692207. Choose your course and type of support want and it will be with you ASAP. Unlike some courses you will be dealt with by my wife, Dot or myself; not a telesales person. I wish you the best of everything what ever you choose to do and hope you find the peace that you desire. Phone 01535 692207 to order now. Hello this is Ian Bracegirdle again with a note of caution and to repeat the guarantee. Allow me to be totally truthful with you, your anxiety it is naturally one of your emotions just as love, joy or anger. The nature of your amygdale’s protective actions will also remain the same, it will always work to protect you. Yes, you could well get times when you could well feel anxious for some periods of time no matter which methods of therapy or learning you choose, be it; CBT, hypnosis, psychotherapy, acupuncture, thought field therapy or self-help. The aim of this programme is to give you the tools so that you can handle these situations yourself, take the control from the amygdala and put the reality into perspective. Your Mind can be Trained. Your imagination and mind can be trained to think positive thoughts or think lots of “what ifs” and doom and gloom catastrophic thoughts. Your brain is not a static organ it is constantly changing as you learn and change your ways of doing things. One of the most notable examples of this happening is when stroke patients who lose their speach are then helped to retrain their brains to recover its use of language. Amazingly this shows how you can retrain your brain to reduce anxiety by what Neurologists call "Brain Plasticity." Which approach would you prefer to use, stay as you are or make the effort to begin the change? I am not going to say it will be easy but if you want to change your life then you do have to commit and make an effort and accept the challenge. Let me Restate my Guarantee……. I believe passionately in what I do, I love to help people, if you do not get out of this programme what you want, in whichever form it is delivered to you I will give you your money back and you can keep all the materials CDs workbooks etc. This is for Twelve months from the date it is delivered to you. Or as an alternative for those people choosing options A and B, I will work with you through phone SKYPE or e-mail until you feel calmer.  Simple relaxation patterns to help anxious moments.  A method to tackle panic attacks quickly.  An understanding of anxiety that will take away its fears.  New understandings of your physiology that causes anxiety overload. Up to date understanding of the psychology of anxiety.  Mental processes to help reduce your fears. Notes about illnesses that could fool you into thinking you have an anxiety. The role of the subconscious part of our mind. Proof once and for all that anxiety or panic attacks won’t kill you. A series of exercise to help reduce stress that undermines control. A mental installation technique that can help to create new habits rapidly. Remember the Guarantee, Money back no questions asked on all options with A and B you could receive extra help to overcome your anxious feelings. Call now 01535 692207 and order your chosen Anxiety to Calm System in person with either Dot or Ian. Remember sometimes we may be busy, use the answer machine or call back later.